A bit of shocking news came out today. 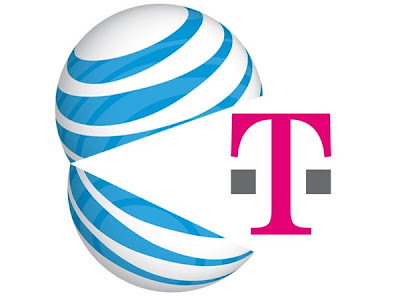 AT&T agrees to buy T-Mobile USA from Deutsche Telekom for $25B cash and the rest in stocks said to total about $39B. The merger between the two companies is not expected to formally take place for about 12 months. The merger will change the mobile landscape in the US because currently AT&T is the nation's second largest carrier at about 90 million subscribers and T-Mobile is 4th with about 33 million. AT&T and T-Mobile both use GSM technology for their phones but they use different bands for their 3G networks. Merging 3G technologies will not be a hurdle they will have to cross as AT&T has plans to start deploying their 4G LTE (Long Term Evolution) network this year. UPDATE: More news was dropped today with details about the merger between AT&T and T-Moble. Apparently T-Mobile has some provisions in place in case the merger is not approved by the Department of Justice (DOJ) and Federal Communications Commission (FCC). If the deal does not get approved, AT&T will have to pay T-Mobile $3B, be forced to accept roaming agreements in areas that T-Mobile does not have coverage and release some of its AWS (3G) bands that are not critical to their network. Basically, if the deal falls through, T-Mobile will gain coverage, 3G frequencies, and pocket $3B in cash. Additionally, AT&T released its plans for what they will do to T-Mobile's network. First, they plan to allow customers to roam for free between both networks basically instantly giving AT&T coverage to the entire country. Secondly, they plan to move T-Mobile customers to AT&T's 3G networks on the 850MHZ band. This will obviously happen as customers are available to upgrade their phones as the customer service reps will sell you a phone with AT&T 3G bands. The average customer won't have a clue what network their phone operates on so that transition should be seamless. AT&T will also switch to dual band towers to service EDGE and 3G networks across the integrated AT&T and T-Mobile networks. As customers leave the 1700MHZ T-Mobile 3G network, AT&T will incorporate that network into their 4G LTE plans. This may seem like information overflow for non tech savvy people but just know that once the merger happens (if it does), your current T-Mobile phone will have better signal in more areas (albeit only on EDGE) and the next phone you buy will more than likely be from an AT&T store that used to be a T-Mobile store. You will also see faster data rates (download and upload speeds) as some of the strain currently on the AT&T network will be pushed over to the T-Mobile towers. This should improve voice and data quality on both networks. In summary, if you have AT&T or T-Mobile, your network just got a lot larger and a lot better even if your cell phone plan and customer service just got a lot worse. At least some of you can stop bitching about not getting the iPhone on T-Mobile. In about 12 months, you'll be on AT&T and can soak up all of Steve Jobs "mistruths" see for yourself what the iPhone has to offer. Hope that if the govt. actually lets this go through that the acquisition will mean T-Mobile not sucking anymore. Download this app "Plug in Launcher" NOW!